Inside: Finally got my new kitchen curtains put up - to match my dining room curtains . 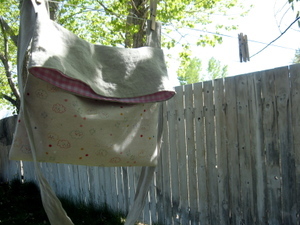 Outside: New dishtowels hanging on the line. I cut all my old ones up to make dishrags. We are really trying to not use any paper towels. I was writing a post for you, but today there is a much more important post here. I wanted to make a new linen skirt for the summer, and after finding the perfect inspiration, broke out my new bias tape maker for some trim. It wasn't quite as easy as I thought it would be, but I got the hang of it and it worked out okay. It's my same old, made-up, vaguely A-line skirt. I made this one a little longer - I thought maybe too long, but after wearing it, I love the length. The inspiration? The cover of The Creative Family. Yup, the book is pretty cool, but I really love that cover photo. After a closer look, I realized that I had the same trim fabric (I think?) in my stash - thanks for the idea, Amanda! Next up, linen crop pants for the boys. We took the 'baby swing' down. We need two 'big kid' swings now. That's cool and just a little bit weird/sad. How is my baby such a big kid now? Potty training him was a breeze - and I'm so not complaining about that. But it struck me as kind of strange today - going to the zoo, I had no pacifiers, no diapers, no pull-ups - and for the first time ever, no stroller. I kind of wish he'd take a cue from his good pal Peter Pan and slow the growing up a bit. Not stop it, but does it have to come so fast? p.s. Like our golf nets? They separate our yard from our garden - one of the lovely benefits of living near a golf course. And we don't even like golf. We are taking a long weekend - hope yours is lovely as well! Maybe, if I'm lucky, I'll be back later with a post with actual photos. I finally picked up some of the awesome (and cheap!) hippo fabric. The kids now have new pajama pants (or shorts). I'm loving them. And I picked up a few sets of cloth napkins (adult-style) and a couple sets of washcloths, which are now the kids version of cloth napkins. 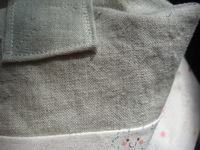 I'd started sewing up some napkins from fabric and sheeting a while back, but wasn't happy with them. Not. Absorbent. 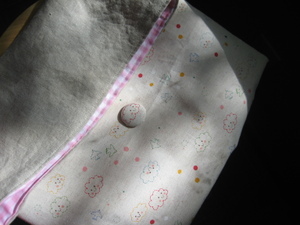 (and a pain to make without a serger). 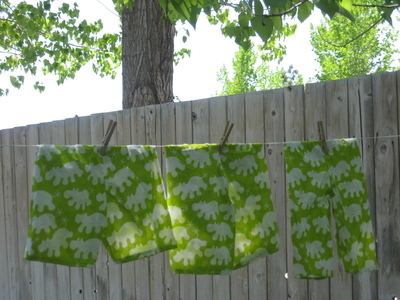 After reading this tip on Parenthacks about using baby washcloths as napkins, I thought I'd pick up some more washcloths from IKEA and use them. So now our napkin basket is stacked with cloth, which makes me happy. We already had a set of these IKEA washcloths, so I'm going to be cutting the cute colored loops off of the 'bath' ones, so we can easily sort them. Hey, do me a favor today? As you go about your daily routines, try and use one less paper product today. 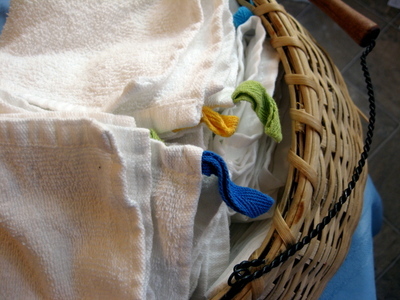 Go for a dish towel instead of a paper towel, try and use less napkins, or figure out your own cloth napkin plan. It's easy. If we all use one less napkin a day, we can reduce the amount of paper in our landfill by a billion pounds. A billion! 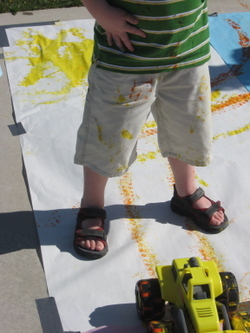 I got to go to an Art Garden Party with Thomas. 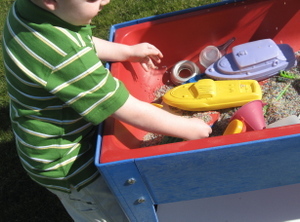 It was an end of the year activity for the kids in the integrated preschool program (delayed/autistic + non-delayed). 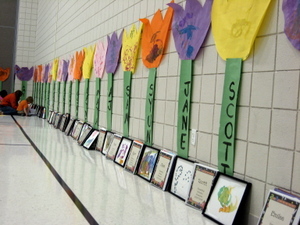 It was way fun - the gym walls were covered with these huge flowers, a notebook filled with photos/anecdotes of each kid + a framed painting they'd done in class. 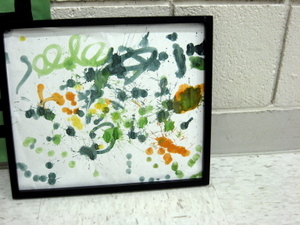 Thomas' painting: I swear the kid is my favorite artist. 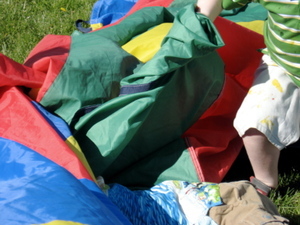 He ran around lots and played with his friends under the giant parachute. It was really great to see that he has friends - friends who were excited to see him and wanted to hang out with him. It's harder for him with the neighborhood kids. 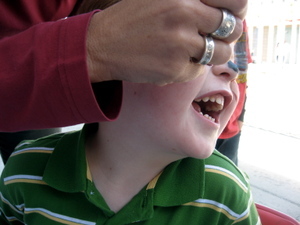 He got his face painted to look like a cat - and it was so very ticklish for him - pretty hilarious. He had everyone around smiling - his smile is so infectious. He had a great time, and when I was tucking him in that night he said: "Thanks for going to my garden party with me." I wouldn't miss it, kiddo! Our trip to IKEA this week was in part to pick up some frames. Not that you need a reason to visit IKEA... but I had a stack of things I've been wanting to frame and hang. 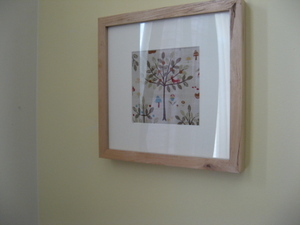 Upstairs hallway - framed Swallowfield print. I didn't hang this too high, so the kids can see it, too. 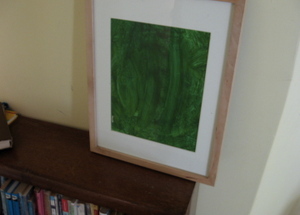 Also in the upstairs hallway (at least for now), my favorite new work from an up and coming new artist (Thomas). It's called 'Dinosaur'. I love the expressive brushwork. It had to be framed. In a small corner of our living room - I framed some of that folklore forest fabric I made a cushion out of. 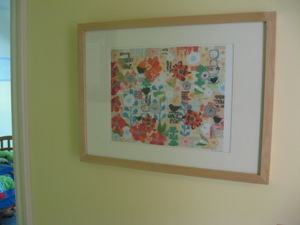 This is a small frame, the opening is about 4" square. 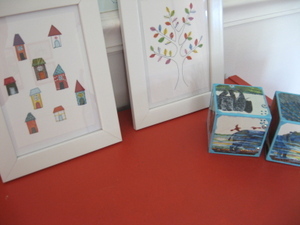 Some of these Syko postcards are going to look great in the playroom. I also picked up a poster frame for the cool poster Chelle gave me a while back - I can't wait to hang the rest of this stuff up! Oh, and by the way, my new bag is handling well - I'm sold on it. And Princess hadn't seen it until we were getting out of the car at IKEA - she stopped short and said "Oh. My. Goodness. That is the cutest bag I've ever seen!" 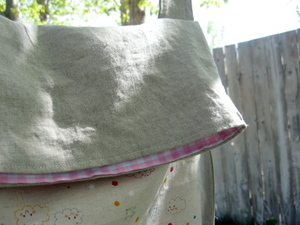 New bag for spring: linen, gingham, and Japanese happy cloud canvas. I just haven't done it yet - For some reason I'm feeling awkward about it - too pink? It's made like a regular tote - but the top folds over like a messenger bag. Should I box the corners to make it a little more 3d? (Design inspired by this cute bag).